In keeping with the intent of maintaining the integrity and character of the block, the proposed buildings will be constructed on the alleys and courtyards behind Larimer Square – 60 feet back from the storefronts. It’s a new idea – or two – for one of Denver’s oldest blocks. Jeff Hermanson, owner of Larimer Square in Lower Downtown Denver, in partnership with Denver based Urban Villages Inc., announced plans to bring new buildings – and new relevancy, vibrancy and activation – to Larimer Square, the city’s first historic district. The proposal includes the construction of two new buildings – the first to be erected on the block in nearly two decades. “When we started looking at doing this project, we wanted to really be deferential to the historic structures and wanted to uphold Jeff’s goal of maintaining the historic nature of the block,” said Buerge. The location of the buildings will not only feel secondary to the historic buildings but also will have the least impact on the heritage buildings, he added. The larger of the two buildings, closer to Lawrence Street, will be accessed from the Kettle Arcade, where visitors come out of the tunneled space into a five-story atrium where the heritage buildings “spill through” into the building’s lobby. The building will feature more solid materials above the historic structures, giving the look and feel that the new structure is floating above the heritage structures, said Buerge. This building, which will look and feel more like its central business district neighbors, will feature retail, restaurants, hotel and event space and condominium units sized to be typical of downtown densities. Think 1401 Lawrence, the Four Seasons, the Hines’ 1144 Fifteenth building, but not nearly as tall, said Hermanson. The building closer to Market Street will feature ground-floor retail and apartments, 30 percent of which are affordable and geared to individuals earning 30 to 80 percent of area median income. The building is designed to be more contextual to its Lower Downtown neighbors both in height and design. Additionally, both buildings are planned to include rooftop gardens and small farms – like the Brooklyn Grange in New York – where produce can be grown to supply the restaurants that operate on and around Larimer Square. The green space above the street level also is designed to engage the public, inspired by the High Line, also in New York. The block’s historic brick alleys will be revitalized and refurbished to become a fully activated pedestrian corridor with an eclectic blend of retail and public spaces, and an alley corridor will offer incubator spaces for burgeoning ideas and businesses what wouldn’t have the opportunity to grow. 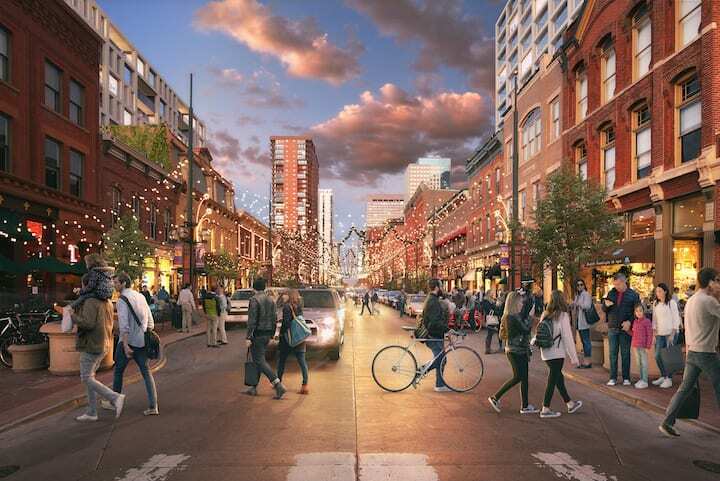 Additionally, a significant portion of the work will include shoring up deteriorating infrastructure, mechanical systems and improving facades of the buildings along Larimer Square as well as redeveloping the Market Street parking structure Hermanson owns into an underground parking, retail, rental housing and office development. Plans are in the early stages for the project, which not only needs typical site plan approval but an amendment for the area’s 64-foot height restriction – an amendment only sought for the footprint of the two new buildings. Ideally, Hermanson and Urban Villages are eyeing a start in late 2019 with a two-year construction time frame. “Jeff prioritized that the block remains vibrant and alive during construction,” Buerge added of the work at Larimer Square, which has undergone a multitude of changes from its beginning in 1861, including its transformation from a dilapidated street in the mid-1900s to Denver’s first historic district through the preservation efforts of Dana Crawford in 1971 to an entertainment district with new buildings constructed on Larimer Square in 2003. “Very early on, when we first started looking at ideas, we really gravitated toward creating a truly mixed-use project – this layering of all different uses, programs intended to create a very holistic, mixed-use community,” said Buerge. While Larimer Square has “dramatically succeeded” over his quarter-century ownership and, previous to that Dana Crawford’s 25-year ownership of the block, Hermanson emphasizes the need for Larimer Square to keep up with the changing city and its densification.